This piece poses a question to me: What came first? 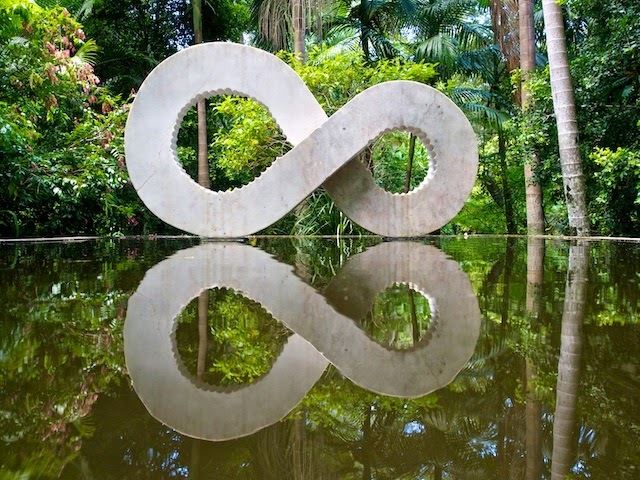 Did the artist wake up one morning with the idea for the sculpture buzzing around in his head, and then when he was finished think: "Hey that looks like the symbol for infinity!" Or was he given a brief along the lines of "Produce a work representing infinity.." and this was his cynical (or ironic perhaps?) response? In any case, it's called Infinity and it was created by Jaroslava Sicko-Fabrici from Slovakia, which is the only reason I will let him get away with having "sicko" in his name! It's quite an eye catching work. It reminds me of a sculpture in an office building here that plays around with some of the same notions- where does it start?